John Malkovich made his name with Chicago's Steppenwolf theatre company. Now he has family, he tells John Patterson, he's sticking to film. Now residing once again on America's east coast, he's also refreshingly free of that airy contempt for the homeland that returning émigrés often display: "I was always fine here," he says when I ask how well he's reacclimatised himself, "and I remain fine, though it was definitely an adjustment. But I go back and work in Europe all the time, so I do get that balance." We talk a little about his new film, a version of Stephen Jeffreys' play The Libertine. It's the story of the self-destructive, often obscene, Restoration poet John Wilmot, the second Earl of Rochester, who died at 33 from syphilis and general dissolution. Malkovich originated the role on stage with his own Steppenwolf troupe in Chicago, but here the part is played by Johnny Depp, showcasing a note-perfect English accent and a splendid, circa-1971 dead-rock-star hairdo. Malkovich takes a back seat, playing a plummy Charles II, who repeatedly banishes Wilmot from court for his degeneracy. And Samantha Morton plays the proto- feminist actress Elizabeth Barry, whom Wilmot takes as protégée and lover. "I thought The Libertine was a study of a person's responsibility to their talent, though I'm not sure Stephen Jeffreys would wholly concur. Rochester was just someone who had extraordinary gifts and he squandered them in nearly every situation. You have to love that in a way. It can be very moving and very human - but it's also quite worrisome. And that's what appealed to me about him." As an artist he's also drawn to Morton's character: "The Elizabeth Barry character appealed to me more because Rochester took a diamond, his own talent, and sullied it, scuffed it, cut and squashed it, until it became, not to say a turd, but a piece of coal. And she took a piece of coal - her own ability - and made a diamond. She was responsible to her gift." Malkovich is also in town filming Beowulf, which Robert Zemeckis, of all people, is directing, using a new kind of digital stop-motion process. The cast includes Ray Winstone - for whom Malkovich has a high admiration and fondness after working with him in Liliana Cavani's exceptional adaptation of Ripley's Game - as Beowulf, Anthony Hopkins, Brendan Gleeson and Crispin Glover. "As I understand it, it'll be an incredibly realistic animation, though Beowulf is seven feet tall. Anthony will weigh 600 pounds. I suppose I'll look more or less like myself. But I'll play my character younger than me, then at age 80, and I'll also play my own son. Something like me but stretched and pulled around in the face." It sounds complicated and tedious. "Oddly, it's almost like doing a play. You wear a funny suit with a lot of light sensors and the computer registers it all, so you just act all day, which is kinda great." Malkovich started out in theatre as a co-founder of Steppenwolf in 1976 - his fellow troupers included Gary Sinise, Laurie Metcalf, Joan Allen and Terry Kinney - and estimates he must have spent eight solid years on stage ("acting all day, kinda great") as the company slowly became one of the most daring and celebrated of American acting companies. Coming from a small industrial town in central Illinois, where his grandfather and then his mother had edited the local newspaper, Malkovich started acting in high school only after his best friend dragged him along as someone to dilute what the friend sensed would be an entirely wussy experience. He found he liked it, and Steppenwolf was composed of friends he later made in the drama department of Illinois State University. At the time, Chicago - "my favourite American city. I'm very much a typical midwesterner, and I don't think the condition is curable" - was a hotbed of challenging theatre. David Mamet was working with the likes of William H Macy and Joe Mantegna, and small companies were springing up all over town, though the Steppenwolves kept mainly to themselves. "We were just too inbred, we were too sick to travel to other addresses. We were sort of upstarts, a bit younger. We were in our own world, only doing our own plays. We didn't have many friends outside our own little group." Steppenwolf made its name in 1984 with a revival of Sam Shepard's True West, which had done unremarkable first-run business on Broadway with Tommy Lee Jones and Peter Boyle. Sinise and Malkovich remade it, playing a screenwriter and his petty-criminal brother, respectively, with Malkovich channelling his own brother, who beat up chubby little Johnny pretty much daily back in their hometown. ("I love my brother," says Malkovich, "but we don't see each other often.") In the TV version, Malkovich uses a prissily menacing voice that markedly offsets his surprising bulk, and Sinise, looking like Bill Gates in high school, constantly flinches from his brother's blows. They took their True West to New York, expecting nothing - but they made a modern classic of the play, and careers for themselves. "I started doing movies because Robert Duvall and Susan Sarandon brought people from showbiz - Mike Nichols, Antonioni, Scorsese, David Puttnam and people like that - and that's where The Killing Fields came from." That small role as Sam Waterston's photographer led to parts in Places in the Heart, Empire of the Sun, and thence to Dangerous Liaisons, and that film's choicest role, the manipulative seducer-manipulator Valmont, which made his name as a movie actor. Jerry Bruckheimer's Con Air, which he admits he did purely for the money, but enjoyed none the less, carried him nearer to the mainstream, landing him the role of the assassin in In the Line of Fire and drawing him into the orbit of Clint Eastwood, whom he admires for his confidence in solitude: "Clint knows exactly who he is and what he wants." After starring in Bertolucci's The Sheltering Sky, he found a second home and a rich parallel career in Europe, and the move would lead to a series of indelible European roles that continues in his work for directors such as Raul Ruiz, Antonioni and Manoel de Oliveira. Having established his own production company, Mr Mudd (which produced Ghost World, The Libertine and the upcoming Art School Confidential), and after working as a movie director himself (the well-received The Dancer Upstairs), Malkovich finds himself on stage a lot less than he used to. "I've found since I had children that it's just too hard. I still like it as much as I ever did. But it means that you either uproot their lives or you just don't see them. And there's only a few years left now where they'll be around. It's three or four months at a time and you can't really go home for a day off." What does Malkovich think he was given by nature - to borrow his own turn of phrase - that got him here? "I think I was born at a time when an American male had so many advantages and opportunities that weren't available to men before or after, just a very brief period. And I think it's not a gift of mine, but one given to me, to be able to ... " - and here he settles into one of these lengthy, word-weighing pauses, inevitably dubbed "Pinteresque", that make transcribing his interviews so easy - " ... to criticise myself and not be crushed, by myself or by others." That seems unusual among actors. "I think it is, and I've had that since I was little. I've permitted myself to learn and to fail with some regularity. And that is probably the one thing I was given, and that I'm still grateful for." 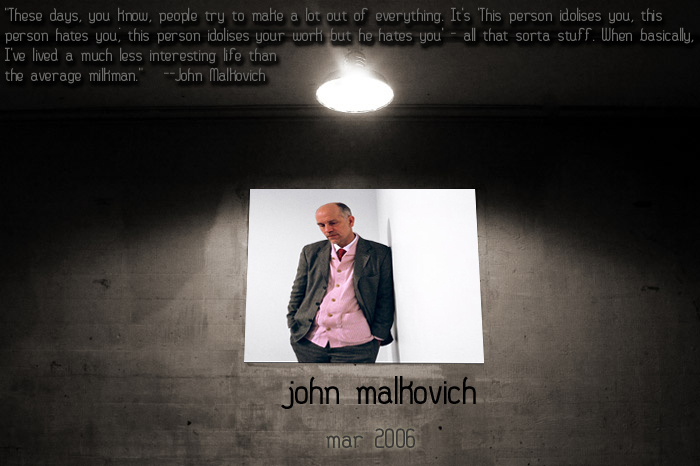 Visit John Malkovich's official website!